1- Apply Natural Nail Base Coat. Let dry. 2- Polish two coats of Milk Bottle on the ring finger. 3- Polish two coats of Spoken from the Heart on the pinky and middle fingers. 4- Polish two coats of Let's Be Friends! on the thumb. 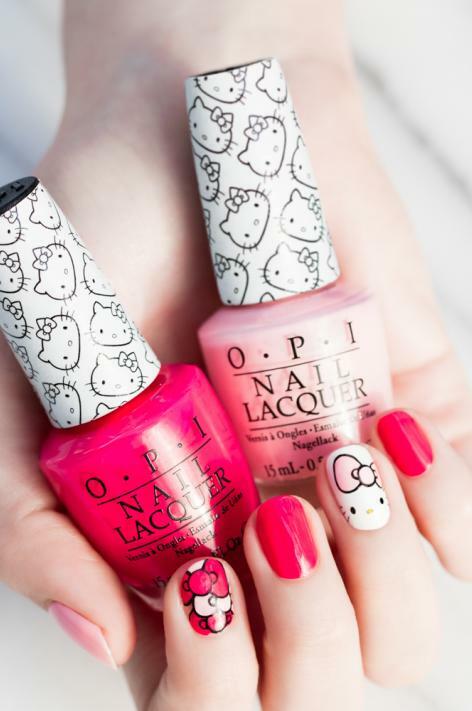 5- On the ring finger, paint a nose (horizontal dot) and two eyes (verticle dots) using Never Have Too Mani Friends! and a thin nail art brush. 6- Paint a dot of My Twin Mimmy on the nose. 7- Using Never Have Too Mani Friends! paint 3 whiskers on each side of the face. 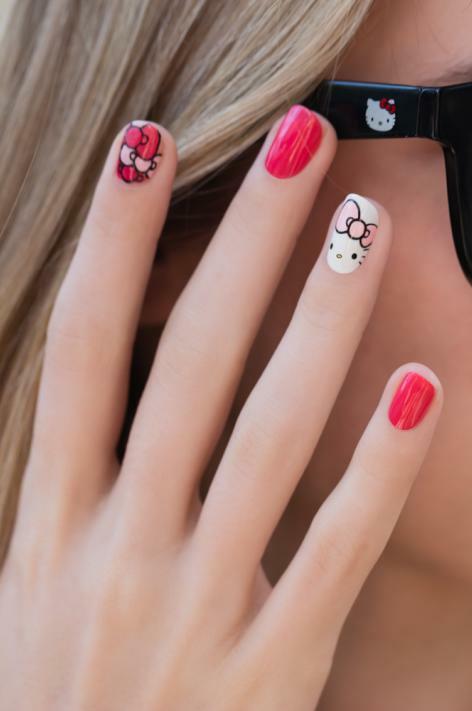 Paint these from the cuticle line inward. 8- Using Let's Be Friends! paint a large circle in the upper right side of the nail. 9- Paint the two sides of the bow, making the left side of the bow larger than the right. 10- Outline the bow using Never Have Too Mani Friends! and a thin nail art brush. 11- On the index finger, paint 3 more bows. 12- Make the bows run into eachother for an overlapped look, but be sure to leave some negative space too! 13- Let Dry. 14- Finish with Top Coat.